Probably never heard of it, huh? Not surprising really, there really isn’t a trail to it, it doesn’t offer the thrill seeker much in the way of exposed scrambles or other technical difficulty. Really it’s just any old high point amongst a sea of greater and lesser high point. Not quite unlike the frozen crest of some molten granitic wave. But really…. aren’t they all? The journey starts at the Bare Mt trailhead, a scant 20 some odd miles down a dirt road from North Bend. For the most part, as of this writing, the road isn’t too bad for most vehicles, but that being said don’t take something you don’t wanna scratch. A NW trail pass is required at this trailhead, FYI. In my opinion the lower sections of this trail are some of the worst. Most of the grade is grapefruit-ish sized rocks, slick with that invisible fungus/algae goo. It can be hell on the knees and ankles, especially on the way back. Eventually you’ll come to a log crossing, which isn’t difficult unless you have terrible balance or just hate crossing logs. There are two to choose from, so take your pick. Note however the old rusted ten-penny nails in the side of the big one. Hmmm…they gotta be there for some reason. 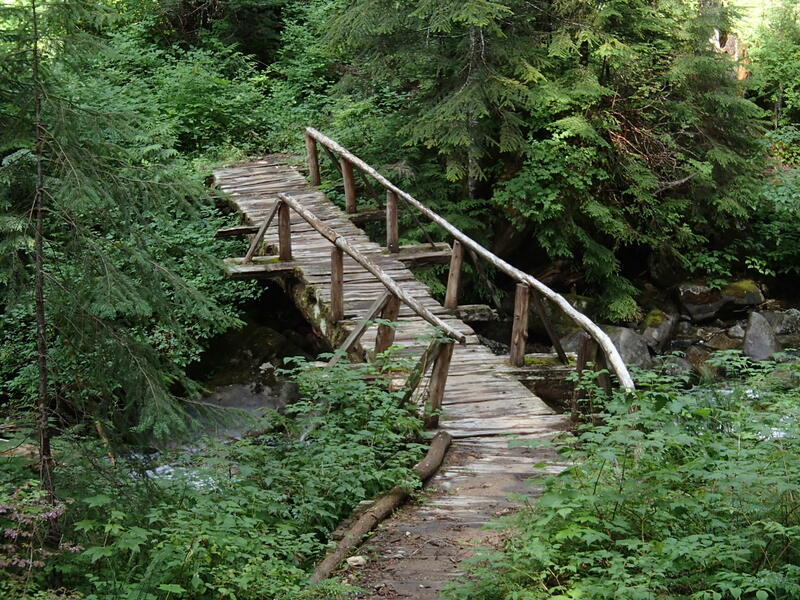 The next waypoint will be an idyllic little bridge, crossing an idyllic mountain creek. I think I saw a painting of this at the Value Village once. Eventually you’ll begin to break out of the trees and onto open stretches of bracken fern and the ever accursed vine maple. 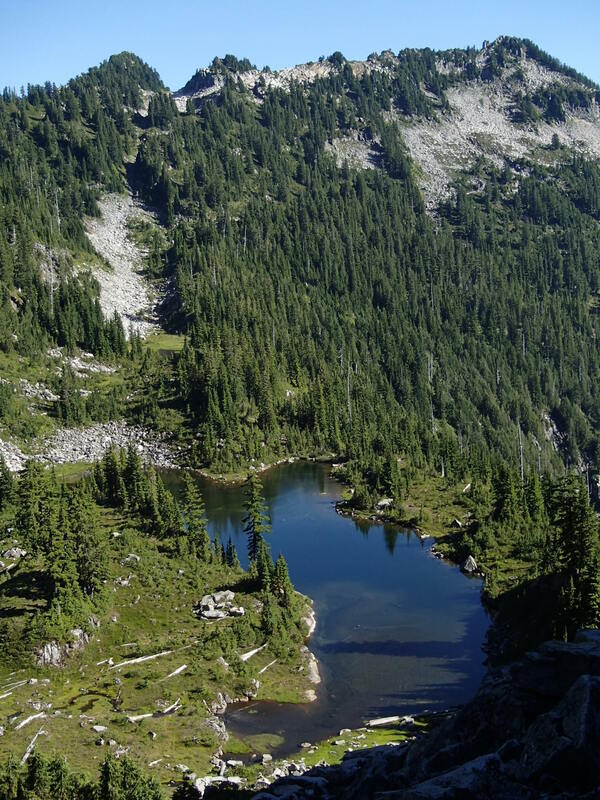 After traversing in the open for awhile you’ll hit an area where you will either notice there is an acute, almost 180° turn (the way to Bare Mt) or you will begin to think that trail maintenance ends here, and blindly continue forward. I really wish someone would put a sign here. On my trips up this way I’ve ran into a handful people beyond this point, most of them surprisingly lost on their way to Bare Mt. Eyes glazed, frantically wandering, forlorn in Bear Basin. 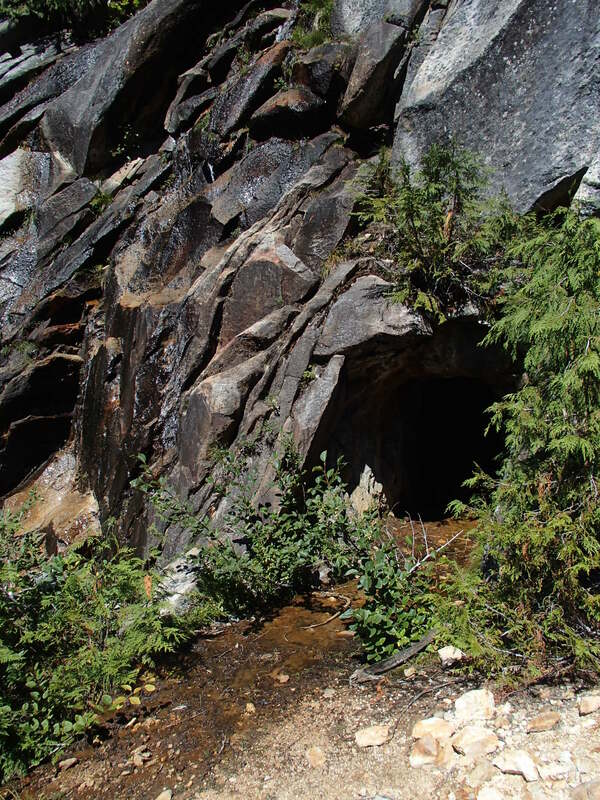 It wouldn’t surprise me if somewhere up in the basin there is a ragged group of lost Bare Mt hikers surviving on blueberries, clad in pika skin clothes, and forever searching for the way to Bare Mt. Anyway, you’ll be continuing onward, through the brush. The trail meanders through the open and back into some woods over a couple old puncheon bridges (hmm… thats weird for a “non trail”) Soon you’ll begin to notice debris, some mining relics, others from an airplane crash many years ago. The trail will split again, this time you’ll wanna go left (up into the basin) You’ll find yourself in a debris strewn area, find the trail that leads out and up into the basin (as of this writing it is marked with a purple dog poop bag) You’ll cross a creek and pass and established camp assembled from the abundant debris (great spot to spend the night btw, also great place to get water if you’re running low) Continue heading up! 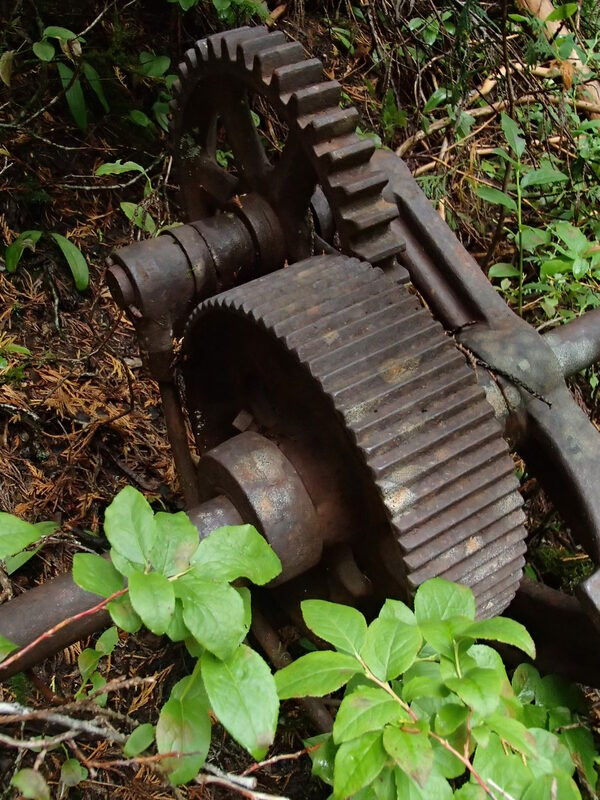 Again you’ll break out of the trees and stumble upon a giant rusted relic known as a donkey engine, it is a sight to behold! Now the pieces of the puncheon puzzle might fit together. 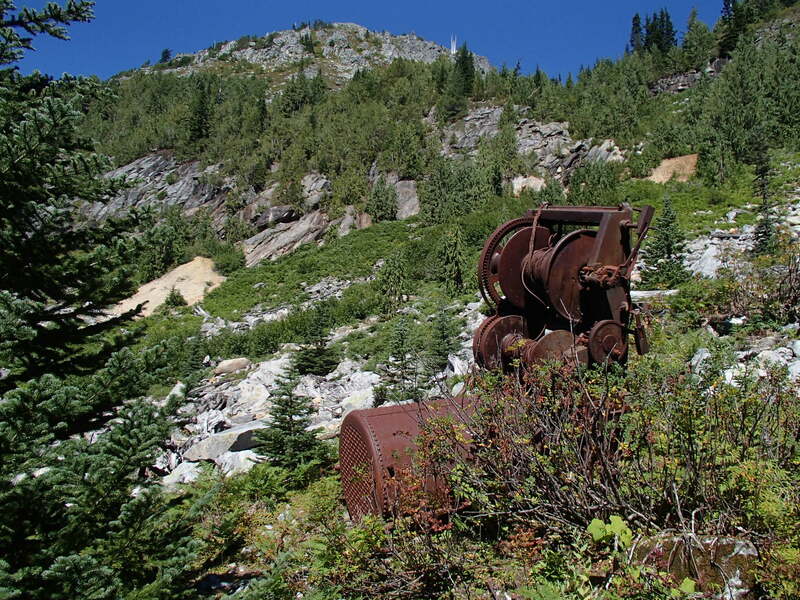 Would it surprise you to know that a century ago the gargantuan iron beast before you skidded it’s way up greased logs all the way from North Bend to this very point under it’s own power? That would have been a helluva thing to witness. After photo ops with the decaying colossus, head up toward the light colored pile of dirt/rock on the right, this is a tailings pile from a mine worked long ago. There is something of a boot path across it, but can be pretty dicey. From the adit, head right looking for a crude path up the hill. It will lead to a small waterfall you’ll have to climb. 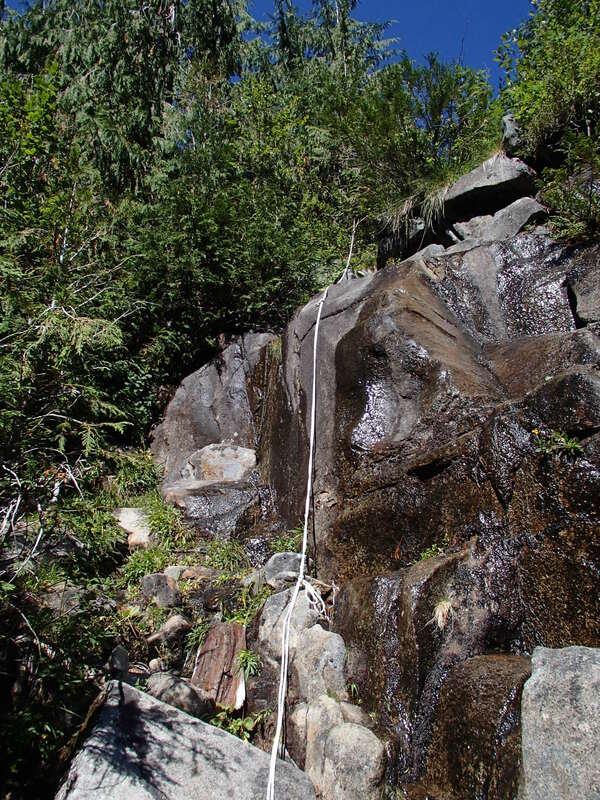 It’s not too difficult, and someone placed a helper rope here. It’ll give you a hand but don’t trust your life to it. 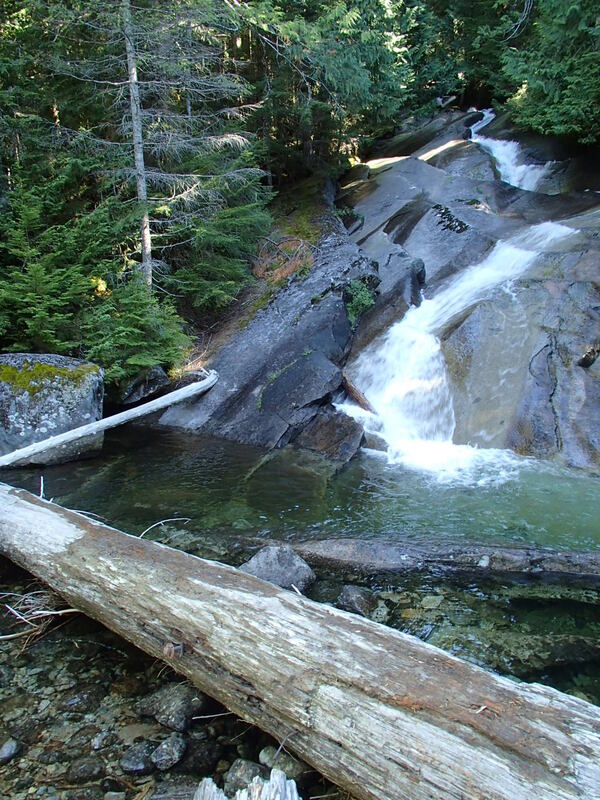 The trail will take you the remainder of the way to the Bear Lakes, crossing steep alpine meadows of heather and blueberry. 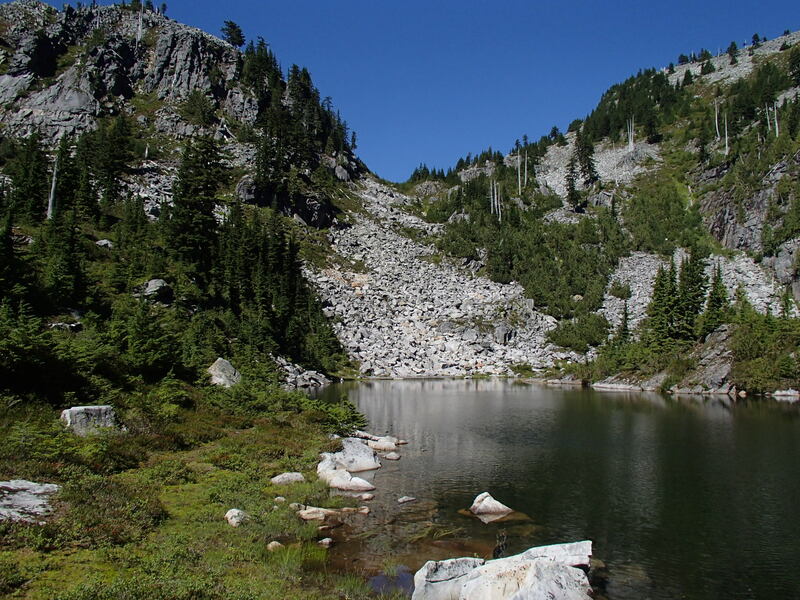 You’ll probably discover that the trail pretty much abandons you at the lake. Don’t let the lack of trail get you down though, you’ve made it this far after all. Make your way to the gap to the north. The pikas here will undoubtedly catcall and cajole you on your way up, don’t let em get in our head. That’s exactly what they want. Routefinding becomes a very handy skill from here on out. From the gap you can look down at the Paradise Lakes and to the north east is the objective, Canoe Peak. 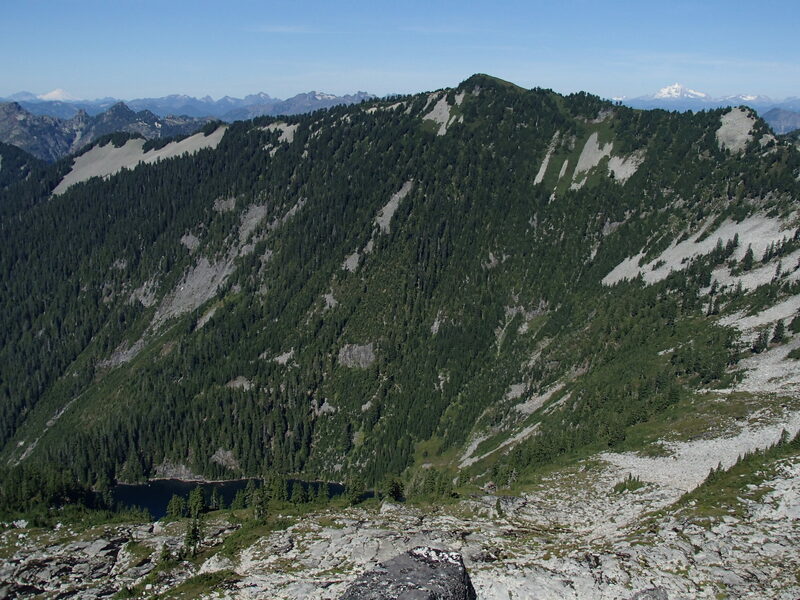 The way is pretty straightforward, gain the ridge and follow it toward the summit. Your main obstacles will be the chaparral like foliage growing along the spine. 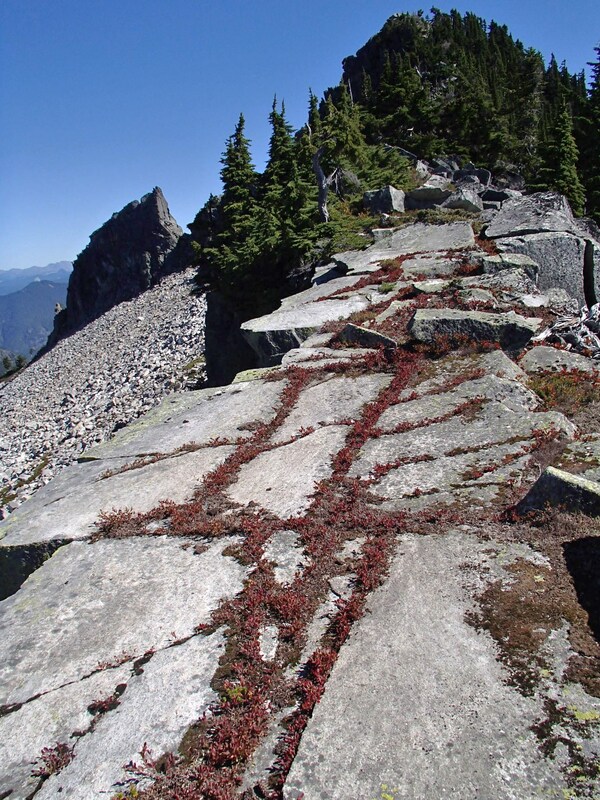 There is only limited scrambling along the way to the summit, none of it exposed, and nothing to write home about. Most of the time you’ll be flip flopping the ridge trying to find a path. While there is no trail, nor path to speak of, there is kind of a “way”. If you’re good at finding such things you shouldn’t have much trouble. If you’re not, well bring someone who is. I was hoping to get lost this weekend in the wild, thanks for the suggestion!